The Crown Hotel’s Legendary Christmas Party Schedule is back for 2018. Celebrate in style with everything you want from the festive season at The Crown Hotel in Nantwich. From a seasonal pantomoine Murder Mystery Night to a Glitzy New Year’s Eve Ball. Enjoy delicious food handcrafted with the finest seasonal flavours, served by our warm, friendly and attentive staff. The Crown Hotel is the first choice for Christmas celebrations in South Cheshire and we have the expertise to make your party go with a swing. Private function rooms are available to cater for 20 – 200 guests or alternatively smaller parties may join our renowned Festive Cabaret and Party Nights held in the beautifully restored Minstrels Ballroom. Not forgetting our Grill restaurant for a Cosy Christmas Party, or of course, our mouth-watering bar meals that are served every lunchtime in the historic Crown Bar. For smaller parties wishing to celebrate Christmas in a quieter setting, our Christmas Luncheon and Dinner menus will be served in the Cavalier Restaurant throughout December. 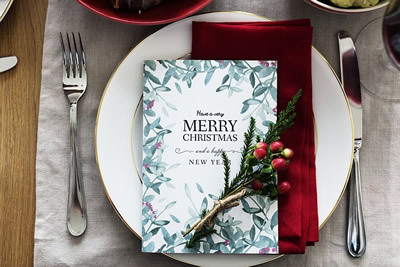 Set in the Minstrels Ballroom of the hotel you will also get to experience a beautiful four course meal, which includes all the trimmings, crackers and Christmas novelties which will really get you in the festive spirit. Remember to reserve some energy though as after the meal we have our resident DJ on till late! The Crown Christmas Cracker Party Night is an ideal choice for smaller parties to join others for a great party night. Available for larger parties to book on a private basis on any night of the week – subject to availability festive spirit. Remember to reserve some energy though as after the meal we have our resident DJ on till late! The Crown Christmas Cracker Party Night is an ideal choice for smaller parties to join others for a great party night. Available for larger parties to book on a private basis on any night of the week – subject to availability. Live entertainment is always a hit at Christmas parties…. This year we are proud to present ‘Baxter’ – the musical pairing of kooky singer/songwriter Hayley Strangelove and rockstar-in-the-making Paul Senior who are no strangers to the live music scene of Nantwich. An off the wall acoustic duo, covering songs you know and love – as well as gems you may have totally forgotten about – in their own inimitable style. Fun, energetic, sometimes sarcastic, but cheekily forgivable for it!! Expect constant quirkiness and ridiculous banter to keep you entertained throughout the evening….This is guaranteed to keep you and your guests on your feet all night long. Set in the Minstrels Ballroom of the hotel you will also get to experience a beautiful four course meal, which includes all the trimmings, crackers and Christmas novelties which will really get you in the festive spirit. Remember to reserve some energy though as after the live music we have our resident DJ on till late! The Crown Christmas Cracker Cabaret Night is an ideal choice for smaller parties to join others for a great party night. Available for larger parties to book on a private basis on any night of the week – subject to availability. This is in line with our privacy notice. Click Here to view.